White Gold Corp. (TSX.V: WGO, OTC – Nasdaq Intl: WHGOF, FRA: 29W) is pleased to announce that high-grade gold mineralization has been discovered at shallow depths on multiple drill holes on the Ryan’s Showing Target, located along trend with the Company’s flagship Golden Saddle deposit 2 KM to the west. The drill holes were completed using Reverse Circulation drilling which is used by the Company to drill shallow, sub-200m holes more cost efficiently than traditional exploration. The drilling was part of the Company’s 14,500m drill program focused on expansion of the existing gold resource on the White Gold property. This program includes expansion of the Golden Saddle deposit and exploration of nearby targets such as the Ryan’s Showing. A diamond drill will be moved to the discovery site to perform additional exploration. Images to accompany this news release can be found at http://whitegoldcorp.ca/investors/exploration-highlights/. Discovery hole WHTRYN18RC0001 intersected 20.64 g/t Au over 6.10m from 83.82m depth, with individual assays ranging from 7.07 g/t to 39.8 g/t Au. WHTRYN18RC0002 intersected 5.02 g/t Au over 13.17 from 121.92m depth, including 9.25 g/t Au over 4.57m from 123.44m depth 100m to the west of the discovery hole. Newly discovered mineralized zone is associated with an east-west oriented, north dipping, structure as shown in Lidar imagery, DIGHEM and IP-Resistivity, which remains open along strike and at depth, and demonstrates the potential for multiple mineralized structures. Discovery situated on 800m x 115m soil anomaly with values from trace up to 1576 ppb Au, on trend with the Golden Saddle with the area between Ryan Showing and Golden Saddle deposit historically unexplored. The Company continues to test similar targets as part of the program designed to expand the existing resource on the White Gold property. The Ryan’s Showing is located approximately 2km west of the Golden Saddle deposit on the White Gold property and consists of gold in soil anomalies (trace to 1576 ppb Au) associated with a distinct east-west oriented, north dipping, structure visible in Lidar imagery, DIGHEM, and IP-Resistivity. One historic drill hole(1) in the area (WGRS11D0003) was drilled subparallel to the structural trend approximately 200m north west of WHTRYN18RC0001 which returned 6.34 g/t Au over 6.56m from 159.44m depth; indicating the potential for high grade mineralization in the area which has been confirmed by holes WHTRYN18RC0001 and WHTRYN18RC0002. The area along trend from the Golden Saddle deposit to the Ryan Showing has been historically unexplored. In 2018, the Company has performed some additional exploration along trend and results will be released in due course. Four drill holes totalling 681.22m were completed on the Ryan’s Showing this year. WHTRYN18RC001 returned 6.10m of 20.64 g/t Au from 83.82m depth, with individual assays in the zone ranging from 7.07 to 39.8 g/t Au. WHTRYN18RC002 is located 100m west of WHTRYN18RC001 and returned 13.72m of 5.02 g/t Au from 121.92m depth; including 4.57m of 9.25 g/t Au from 123.44m depth. The current geologic interpretation indicates that neither WHTRYN18RC003 & 004, located approximately 150m to the west and northwest of WHTRYN18002, respectively, were drilled deep enough to intersect the mineralized structure(s). The reported RC holes were drilled at a 180o azimuth and -60o dip. Follow-up diamond drilling is planned for the target and will be commenced during the 2018 season. Significant drill results from the Ryan Showing are detailed in the table below. 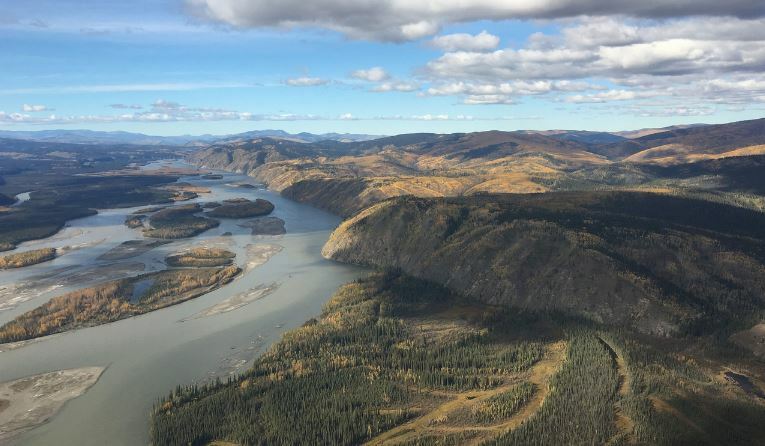 The White Gold Property is located 95km south of Dawson City, Yukon. The property’s 1,792 claims totaling 34,951 hectares are 100% owned by the Company. The property has an airstrip, barge access, and a fully operational 100-person camp. 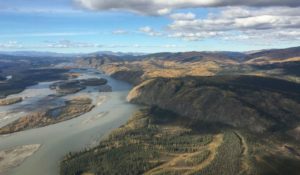 The Yukon Resource Gateway Project funded by the federal and territorial governments will provide year-round road access to the property. Reported in Independent Technical Report for the White Gold Project, Dawson Range, Yukon, Canada by Gilles Arseneau, P.Geo. dated Sept. 15th, 2017 and available on SEDAR.